Since progress lately has been more along the lines of slowly rather than surely, we finally broke down and admitted to ourselves that this project was never going to be completed unless we hired some outside help. Besides, The Shack is literally falling down around us. For the past five weeks our new contractor and his helper have been hard at work by 7:30 nearly every weekday morning. Great headway is being made, and we're both extremely excited. It looks like 2008 really will be The Year We Move Out Of The Shack. It's like a checkbook-draining dream come true. The builders weren't planning to start until the end of this month, but a spot opened up in their schedule and anybody who's ever had construction done or watched the movie "The Money Pit" knows that you never, ever turn away a contractor who is willing to show up and work. Because of our schedule, however, this has necessitated my becoming more involved with the project at this point than was originally planned. Suddenly I've been busy making command decisions about phone jacks and bathroom lighting while frantically trying to figure out whether we might someday want to put in a bigger refrigerator or a second seven-foot-wide deck oven. I also get to go pick stuff up. I now know what it feels like to spend five and a half hours shopping alone at Lowe's Home Improvement Center. The other day, arriving mostly clueless and clutching a very long list, I systematically worked my way through what felt like 3,000 miles of aisles, pouncing on every one of those PRESS THIS BUTTON IF YOU NEED HELP thingies I could find. But since the store was practically empty of customers - everybody else was apparently out shopping for holiday presents rather than junction box covers and 33 feet of 10-3 wire for the dryer - there was only a skeleton crew on the floor. The third time this one guy rounded a corner and saw me standing by the help button he actually blurted out, "Not you again!" At least he was smiling when he said it. After I'd sweet talked another guy into helping me pick through an enormous pile of 2x4s in search of 32 really pretty ones (did you know you can use a garden hoe to pull the far stacks of boards within reach? ), and yet another one into helping me secure said 2x4s (along with the several dozen other boards I'd picked out myself) in the bed of the truck, I headed out into the dark and foggy rain for the 90 mile drive back to the farm, smiling at the half-price rosemary topiary I'd treated myself to as a reward for making it out of the store alive. It's important to learn new things, and I'm proud that I can now carry on a semi-intelligent conversation about RACO boxes, ring shanks, and SEU cable. I understand the difference between full round head and clipped head nails, and I've fallen head over heels for 1x4s, which from now on I will refer to as 'girl boards.' I also know more than I ever thought possible about breaker boxes and pulling amps. This is all very thrilling of course, but I'd much rather be baking than taking Wiring 101, especially as I watch our bread bakery finally becoming a reality. It's a proven fact that all workers are 50% more productive when they've been well fed (no, really), and our two builders informed me early on that they love baked goods of any sort. When I'm not stuffing them with molasses ginger spice snaps, Mexican monkey cake, or my whole wheat chocolate chip and raisin cookies—which they both declared were the best cookies they'd ever eaten—I've been experimenting with new bread recipes, including this one. This is the second recipe I've made from a wonderful European book called Bread: Artisan Breads from Baguettes and Bagels to Focaccia and Brioche by authors and cooking instructors Eric Treuille and Ursula Ferrigno (he's French, she's Italian). If you learn best by looking at pictures, then this is definitely the book for you because it's packed with gorgeous, full-color photos. And while it's perfect for beginners, I think many experienced bakers would also enjoy it. I've already discovered all sorts of handy tips and useful nuggets of information. The carrot herb rolls I created last month using the carrot bread recipe were a big hit, and there are several other breads I'm planning to make. At around $15, this book is also a bargain. Pane di ramerino has been baked daily throughout Tuscany since the early 16th century. As you can see, this is a beautiful bread, and it would not only be perfect to serve to guests but would also make a lovely gift. Thankfully the recipe makes two small loaves so you can spread the yeasty joy and still have some left for yourself. I never would have thought to combine raisins and rosemary in bread, but the result is delicious. The flavor of the rosemary is subtle, so double the amount if you want to taste it more. It also makes amazing toast, which I've been eating slathered with apricot jam and thinly sliced sharp cheddar cheese. This may sound like an odd combination, but it reminds me of the cheese and chutney sandwiches I was introduced to by an English pal when I was a kid. The authors claim pane di ramerino is a superlative breakfast bread and "quite simply the best accompaniment to fresh goat cheese." My friend Amanda, who writes about glorious Mediterranean food at Figs Olives Wine, suggested using this bread to make her cool weather bruschetta with ricotta salata and thyme. Mmmmmm. I'm thinking it would also make marvelous French toast - perhaps for brunch on New Year's Day. I've never had good luck using those little packets of yeast, and they're pricey. Instead I buy instant yeast in inexpensive 1-pound packages and store it in a jar in the freezer, where it will keep for at least a year. 1. Mix the flour and yeast in a large mixing bowl. Make a well in the center and add the milk, rosemary, raisins, olive oil, and eggs. Mix to form a soft, sticky dough, adding extra flour, 1 Tablespoon at a time, if the dough is too moist. 2. Turn the dough out onto a lightly floured work surface. Knead 6 minutes. Cover the dough and let it rest for 20 minutes. 3. Knead in the 1½ teaspoons salt, and continue kneading until the dough is silky, springy, and elastic, about 5 to 8 minutes. 4. Put the dough in a plastic lidded container (or in a large bowl covered with a damp tea towel) and let it rise until doubled in size, about 1½ to 2 hours. 5. Divide the dough into two pieces. Shape each into a round loaf and place on a well floured couche or work counter. If you don't have a baking stone (they make the best pizza and bread! ), bake your focaccia on a heavy duty baking sheet. I've been using the heck out of some of my commercial rimmed baking sheets for 20 years for everything from baking scones to roasting Brussels sprouts. Lightly dust tops of loaves with flour and cover with a damp tea towel. 7. Cut a slash, 1/2 inch deep, across the top of the loaf, then another in the opposite direction to make an "X." 8. Bake in the preheated oven (directly on the baking stone if you're using one) until golden brown and hollow sounding when tapped underneath, about 30 minutes with a baking stone and 45 minutes without. Cool on a wire rack. **A NOTE ON YEAST: I prefer to use instant yeast when baking bread because you can add it straight in with the dry ingredients. If you're using active dry yeast instead of instant yeast, you'll need to proof it first. For this recipe, place the 1/2 cup of warm milk in a small bowl and sprinkle the yeast over it. Let stand for 5 minutes, then stir to dissolve. 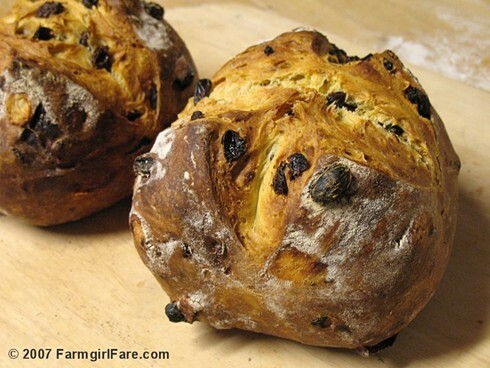 Add this yeast mixture to the flour along with the rosemary, raisins, olive oil, and eggs. Instant yeast is stronger than active dry yeast, so some bakers recommend using up to 25% more active dry yeast than the amount of instant yeast called for in a recipe (that would be 2½ teaspoons for this recipe). Others substitute active yeast for instant yeast 1 to 1. This may take your dough a little longer to rise, but that will only result in even better tasting bread. Alternately, if a recipe calls for active dry yeast and you want to substitute instant yeast, you may want to use a little less. The original version of this recipe actually called for 2 teaspoons of active dry yeast and I simply used 2 teaspoons of instant yeast instead. © FarmgirlFare.com, the yeasty foodie farm blog where Farmgirl Susan shares stories & photos of her crazy country life on 240 remote Missouri acres. Who needs TV when you have Lucky Buddy Bear? There will be breakdancing by the barn at 1:00 and 3:00, along with a special bedtime performance at 5:00 which will be followed immediately by molasses tuck-in treats for all. Have a Merry & Amusing Christmas! 12/12/06: Where Does The Time Go? 12/11/05: Ever Cut Firewood In The Snow? I Have! 12/13/05: Yo! So I'm Not Good Enough To Donate? 12/16/05: Where Did She Go? © Copyright 2007 FarmgirlFare.com, the award-winning blog where Farmgirl Susan shares stories & photos of her crazy country life on 240 remote acres. Have you ordered from the Menu For Hope yet? Just a reminder that our annual food blogger fundraiser is going on now. Your $10 donation will support an innovative school lunch program in Lesotho, Africa and buy you a raffle ticket toward one of dozens of amazing prizes. 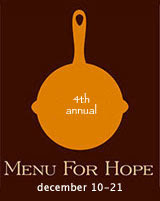 Read more about Menu For Hope (including the prize I'm offering this year) here. Wondering how your money is spent? Over 86% of donations go directly to the children and farmers in Lesotho. When a discount chain builds a megastore out here, they put in new stoplights and create special turn lanes. When an Amish community moved to the area last spring, yellow traffic signs popped up along the highway sporting pictures of horse-drawn buggies and asking us to Share The Road. I gladly do. As for taking this picture, don't worry--there were no other cars around and I'd slowed down to one horsepower speed. 12/6/06: Cary Is Seven Months Old Today! © Copyright 2007 FarmgirlFare.com, the soaring foodie farm blog where Farmgirl Susan shares stories & photos of her crazy country life on 240 remote Missouri acres. The judges have made their decisions, and the finalists for the 2007 Food Blog Awards have been announced. Now it's time for you to vote. 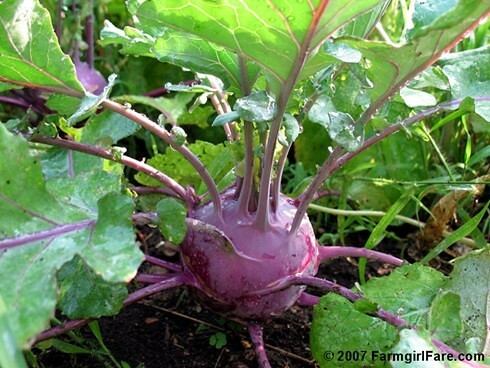 I'm thrilled that Farmgirl Fare is in the running for Best Food Blog - Rural. If we do happen to be your favorite rural food blog, I hope you'll pop over to the Well Fed Network and vote for us--but not before checking out the delightful (and stiff!) competition of course. If you aren't familiar with Nami-Nami, Garlic Breath, and Lucullian Delights, you're in for a real treat. There are thirteen other categories to vote in, too, and all sorts of yummy food blogs to discover. The polls are open and will accept votes up until Friday, December 14th, 11:59 pm EST. So spread the word, have fun, and thank you for your vote! There's nothing that takes the chill off like the warmth from wood heat--except maybe watching a hunky farmguy whack a giant tree into pieces. This photo was taken early on Thanksgiving Day while we were out working up an appetite in the freezing cold. I was very thankful that it was Wear Your Chaps To Work Day. Just a quick note for those of you who read my recent post, "Easy & Delicious $6 Holiday Gift Idea: Homemade Beer Bread Mix In A Beautiful Baking Pan," and didn't have a chance to order any of the sale-priced Chicago Metallic 1-pound loaf pans before they ran out of them at Amazon. They're now back in stock for $5.75 (regularly $11.00), are eligible for free shipping, and are also included in the 4-for-3 promotion currently going on. But I'd order soon, as they keep selling out at this special low price. In addition, now through December 15th, if you spend $25 or more in the Amazon.com Home & Garden Store (which is where the loaf pans are), you'll receive a free one-year subscription to Bon Appetit, Gourmet or Domino magazine for yourself or someone else. That could be another holiday gift effortlessly checked off your list. Click here for more details. I love these pans, and I know you and your Beer Bread Kit recipients will, too. Happy baking!